Jo and Glenn Poshard, Center, Surrounded By Social Service Providers at John A. Logan College on Friday April 28th, 2017. Over two dozen Social Service agencies in southern Illinois will be able to better serve abused children and their families, thanks to a six figure grant announced Friday by the Poshard Foundation For Abused Children. Foundation Director Jo Poshard says that 100 thousand dollars will be distributed to 30 groups in southern Illinois to help successfully deal with abused, abandoned and neglected children. Mariah Hayes, Executive Director of CASA of Franklin County says her service will use the money to launch a visitation center, to create a homelike environment for children involved in protective custody hearings. Jenine Woods, the Executive Director of the Cairo Women’s Shelter says some of her group’s grant money will provide care packages to those affected by the recent HUD decision to relocate 100s of families from the Cairo Public Housing Complex. 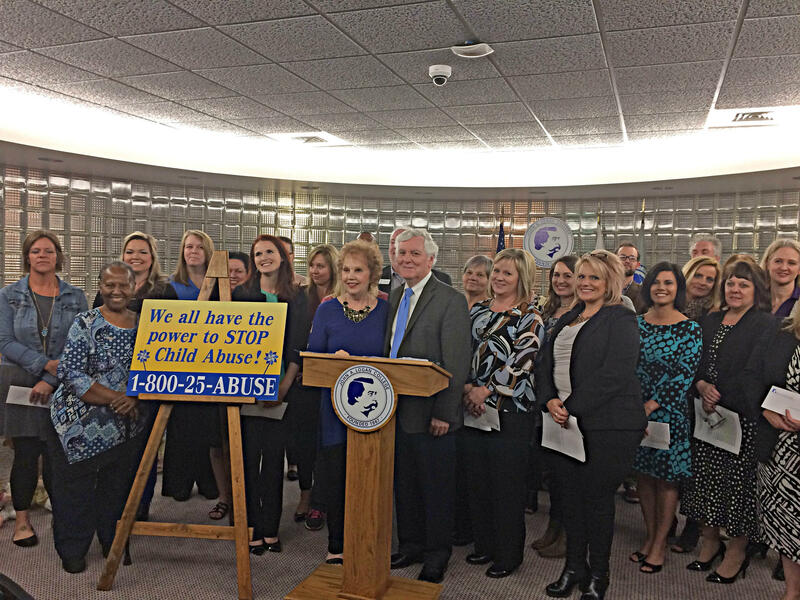 Poshard emphasized the need to be aware of child abuse all year long, especially since child abuse rates in the 20 southern counties in Illinois are double, triple or even quadruple the rest of the state.